Commercially available full-color 3D printing allows for detailed control of material deposition in a volume, but an exact reproduction of a target surface appearance is hampered by the strong subsurface scattering that causes nontrivial volumetric cross-talk at the print surface. Previous work showed how an iterative optimization scheme based on accumulating absorptive materials at the surface can be used to find a volumetric distribution of print materials that closely approximates a given target appearance. In this work, we first revisit the assumption that pushing the absorptive materials to the surface results in minimal volumetric cross-talk. We design a full-fledged optimization on a small domain for this task and confirm this previously reported heuristic. Then, we extend the above approach that is critically limited to color reproduction on planar surfaces, to arbitrary 3D shapes. Our proposed method enables high-fidelity color texture reproduction on 3D prints by effectively compensating for internal light scattering within arbitrarily shaped objects. In addition, we propose a content-aware gamut mapping, that significantly improves the color reproduction for the pathological case of thin geometric features. 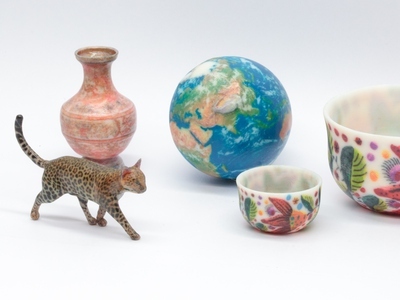 Using a wide range of sample objects with complex textures and geometries, we demonstrate color reproduction whose fidelity is superior to state-of-the-art drivers for color 3D printers. Conditionally accepted to ACM Transactions on Graphics (Proc. SIGGRAPH), 38(? ), 14 pages, 2019.Denis Sumin, Tobias Rittig, Vahid Babaei, Thomas Nindel, Alexander Wilkie, Piotr Didyk, Bernd Bickel, Jaroslav Křivánek, Karol Myszkowski, and Tim Weyrich. Geometry-aware scattering compensation for 3D printing. Conditionally accepted to ACM Transactions on Graphics (Proc. SIGGRAPH), July 2019.Sumin, D., Rittig, T., Babaei, V., Nindel, T., Wilkie, A., Didyk, P., Bickel, B., Křivánek, J., Myszkowski, K., and Weyrich, T. 2019. Geometry-aware scattering compensation for 3D printing. Conditionally accepted to ACM Transactions on Graphics (Proc. SIGGRAPH) (July).D. Sumin, T. Rittig, V. Babaei, T. Nindel, A. Wilkie, P. Didyk, B. Bickel, J. Křivánek, K. Myszkowski, and T. Weyrich, “Geometry-aware scattering compensation for 3D printing,” Conditionally accepted to ACM Transactions on Graphics (Proc. SIGGRAPH), Jul. 2019.